Digial Hybrid System - Your business needs a reliable telephone system that incorporates today's sophisticated digital technology with features that make business communications easy and efficient. You don't have to spend a fortune on complicated applications you don't need, and cumbersome equipment that requires an advanced degree to use. The solution is the Vodavi STARPLUS DHS - the Digital Hybrid System designed to meet the communication needs of small businesses. The Vodavi STARPLUS DHS combines performance, quality and value to provide small businesses with a communications system they can count on. System size starts from 3 lines and 8 telephones with flexible expansion up to 9 lines and 24 telephones or 12 lines and 16 telephones. This is a telephone system specifically engineered for small business with features designed to maximize employee productivity. Don't be intimidated when we tell you that the Vodavi STARPLUS DHS includes over 200 system and station features. We know that having loads of features doesn't help if they're too complicated to use. So the Vodavi STARPLUS DHS actually makes features easy to access through both the large LCD screen's menu prompts and soft keys which can be programmed with specific features so each user can customize to meet their needs. Communication is critical and your telephone is your primary communication tool. It has to function effciently in order for you to communicate effectively. 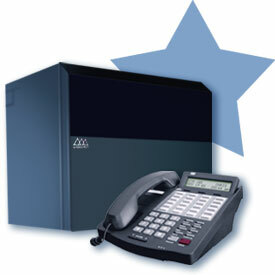 We designed the Vodavi STARPLUS DHS telephones to promote communication effectiveness. Red and green LED's differentiate the line you are using from the other lines in use. Programmable feature buttons and soft keys give you one touch access to the features you use most. The large dial pad helps ensure accuracy every time you dial. With the Vodavi STARPLUS DHS, you can use the optional Analog Adapters to connect any single line device such as a fax, modem, credit card verifier, cordless phone or answering machine to the digital telephone's ADP jack. Each device has a separate extension number so you can use them simultaneously, increasing user productivity and enhancing customer service. Imagine being able to fax a document while talking on the phone or verify a credit card number while the customer is still on the phone. Optional Analog Adapters generate "port gain" which provides the flexibility to split the digital channel and serve two single-line devices with one digital port. Up to 46 analog units can be supported by the system using this approach. Likewise, "pair-gain" solves logistical challenges when you need expansion in a location that is limited by the number of cables serving it. With Voice Over Busy, you can communicate with an inside party that is either on a call or using the speaker phone, without interrupting the outside party. A reply can be sent to the display of the inside party via the Mute button toggle. Say goodbye to time consuming, complex programming and access codes. Soft keys located under the super-sharp LCD enable you to instantly access the most commonly used features as they are displayed on the screen. Want to make a conference call? Just push the button as it appears on the display! With Vodavi STARPLUS H-T-P operation, a flexible button can be programmed for station users to receive internal calls hands free (two-way), with a tone signal or in privacy mode (call announce only). Dual color LEDs indicate your selection. With DISA. authorized system users can call in from any touch-tone telephone and access the system's CO lines to make outgoing calls expanding the reach of your office system. Benefit from system's features such as; conferencing, transferring and call forwarding from your home or when your on the road. In addition, callers can dial a station directly, eliminating the need for them to be transferred to the attendant.